How can you use strawberries to serve your customers? That’s easy! Top them with shortcake, whipped cream, and our favorite, ice cream. 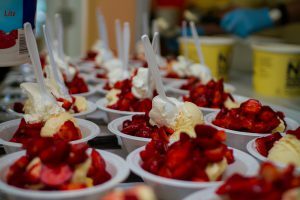 At Newby Management, Strawberry Socials are a tradition that has continued for almost 30 years, hailing all the way back to our founder’s childhood. Martin Newby grew up on a farm in Iowa. Along with the normal crops, they also grew potatoes, cabbage, sweet corn and 3 1/2 acres of strawberries. At the end of the season, his mom and dad had the idea to invite the neighbors to bring homemade ice cream and they would supply the delicious strawberries. The birth of the first Strawberry Social was enjoyed by some 200 people on the front lawn of the farm. As an adult in business, Martin was always looking for ways to provide extraordinary customer service to his customers. As he researched, providing a quality experience for consumers was a good place to start. Thinking back to his teen years on the farm, he remembered the Strawberry Socials with fondness. He felt these could be recreated for all residents. Today, these Strawberry Socials are a point of fun and excitement in our communities. Residents gather together to laugh, fellowship and share life together. These aren’t any strawberry desserts either. It all starts with a generous helping of vanilla ice cream, topped with a decadent piece of shortcake, followed with a large scoop of strawberries and finished with a dollop of whipped cream. Newby Management team members head across the state during the months of February and March to help serve up these delicious deserts to residents. It’s a sweet way to give back to our residents through service.